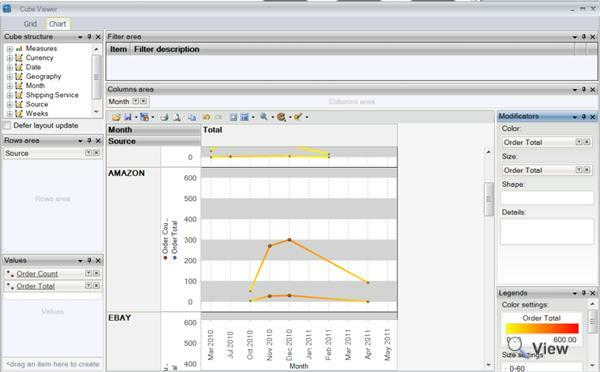 Linnworks Analytics is a comprehensive reporting tool that sits directly on top of Linnworks database. Linnworks Anayltics is based on OLAP (Online Analytical Processing) concept, therefore it is extremely flexible, functional, fast and capable of dealing with huge datasets. The tool allows you to build your own reports and manipulate the data to get the answers you are looking for. The reports are stored locally on your PC. 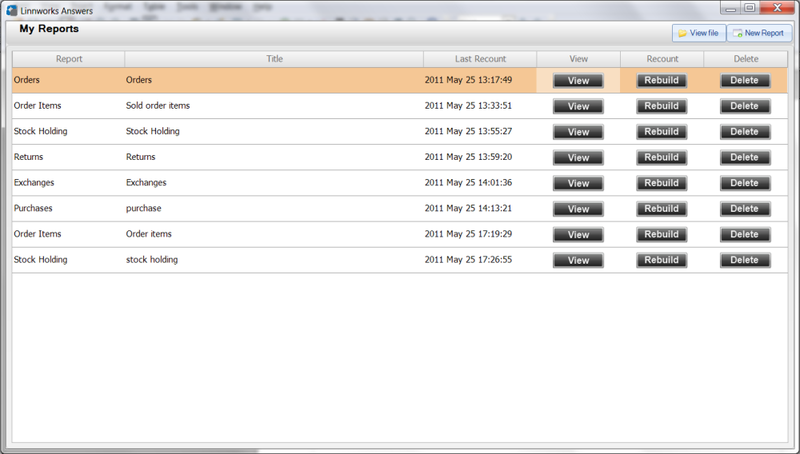 The report builder downloads the data from the database to your PC and compiles it into a browsable report. All the reports are listed in My Reports list, from here you can launch report viewer, reconfigure the report and rebuild report. A report contains that was downloaded into the report at the time of the build, therefore to get the latest data you need to recount/rebuild a report. A report contains measures and dimensions. Measures are what you actually measures in the report, these are sales total, quantities and so on. Dimensions on the other hand is what you plot the values against, such as Month, Products, Sales channel and so on. 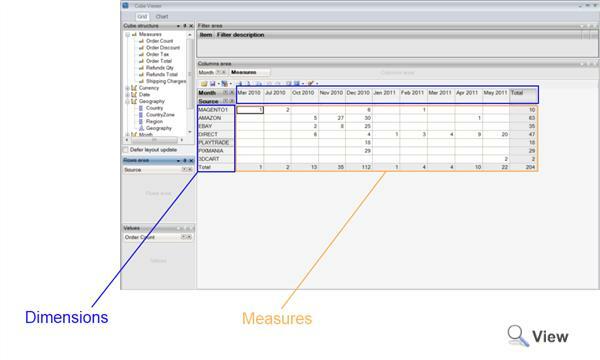 Using the combination of measures and two dimensions you can create a table containing measure values. 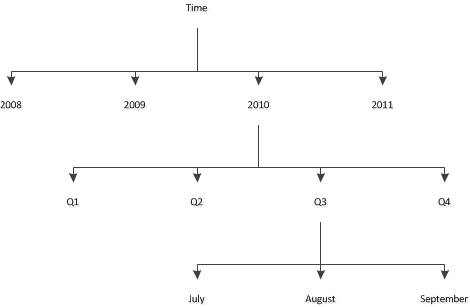 Reports can be viewed in graphical form as a chart. The principle is very similar to viewing the data numbers. 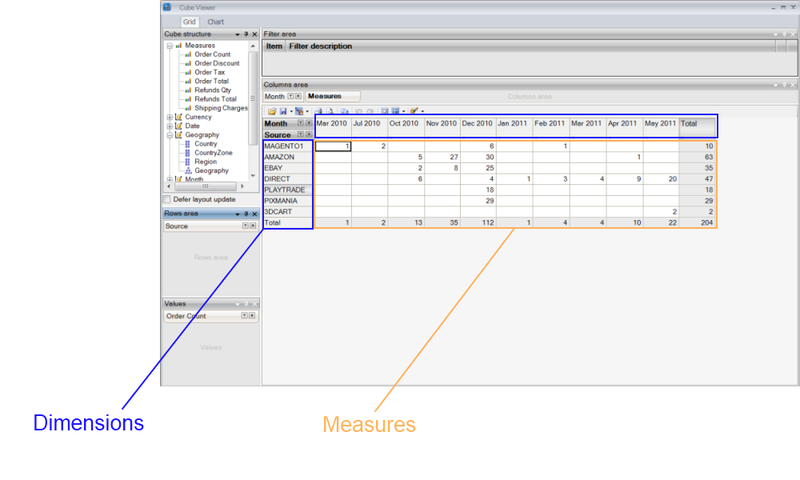 You use measures as series values and dimensions to plot the values on an X axis or split the chart into sections or multiple charts. The report data can be exported into spreadsheet or exported as a Comma Delimited file (CSV). You can copy and paste the data from the grid directly into a spreadsheet or save the report as Excel file. Top level order sales report. Report takes only processed orders into account, measures total order count, order totals, shipping charges, discounts, tax, refunds and quantity of refunded orders. Available with time dimensions, source, currency, geography and shipping services. Note: Totals are reported for all currencies as aggregated value. If you have orders in different currencies, ensure you have entered a filter for a specific currency or included a currency dimension in your selection. Sales reported by order items. Measures products sold, sales value, stock cost (profit margin = sales value – stock cost), refunds and refund quantity. Dimensions: items, time dimensions, source of the order (channel), currency, geography and shipping service (order). Note: Totals are reported for all currencies as aggregated value. If you have orders in different currencies, ensure you have entered a filter for a specific currency or included a currency dimension in your selection.Purchases - Reports purchase orders and purchase items, average unit cost, total cost of items purchased, quantity of items. Reporting by supplier, location, stock items and time dimensions. Report showing how much stock you hold by location, products and most importantly by time. All values reported are an averages by dimension. With the actual stock holding figure reported by day (how much stock you had at the end of that day). Note: This report can get extremely big if you include time and stock item dimensions. Ensure you limit the time dimension to no more that 2 month if you have more than 1000 items in stock. Very large reports will stall Linnworks Anayltics and prevent you from rebuilding the report and may affect performance of Linnworks itself. Order item returns. Measures number of returns, value of returns and number of scrapped items. Available dimensions are time, return category, source of the original order and stock items. Order item exchanges. Measure number of order items exchanged, additional costs, refunds. Available dimensions are Returned Item, Exchanged Item, time dimension, Exchange category and source of the original order. Order item resends. Shows how many orders you had to resend, reports resend category (reason for resend), shipping service and stock item dimensions. Time dimension is based on the order date of the order being resent. This glossary of terms is designed to help users of Linnworks Analytics gain an understanding of how the system deals with and displays data. A measure is what you are actually measuring in the report. It is the data values that occupy the cells, as defined by the dimensions selected. This can be data such as Sales Totals and Quantities. Dimensions are what you are evaluating the measures against. It is essentially how you want to see your data and the perspective used to view it. Examples of dimensions include Products, Time, Location, Sales Channel, etc. Transaction was deadlocked on lock resources with another process and has been chosen as the deadlock victim.